Jorgen Hus speaking in La Ronge. Photo courtesy of Braden Malsbury. 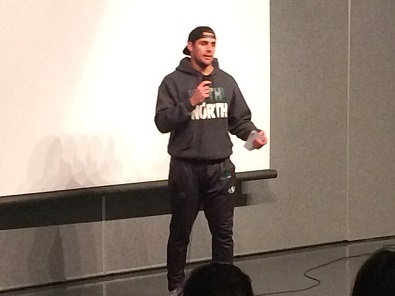 Saskatchewan Roughriders long snapper Jorgen Hus was in northern Saskatchewan for the past two days, delivering presentations to students that touched on bullying and building healthy relationships. Hus was at Senator Myles Venne School, as well as Churchill Community High School in La Ronge on Wednesday. The Saskatoon product admits, the students were receptive to his message. Hus’s presentations were part of the Cameco Northern Tour. Jorgen was also speaking to children on Tuesday in Southend.